1 Who was Chuck Connors? 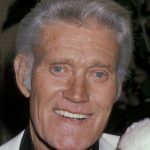 7 Do You Know How Rich Chuck Connors Was? Born as Kevin Joseph Aloysius Connors on the 10th April 1921 in Brooklyn, New York USA, he was an actor, basketball player and baseball player. He came to prominence with a role of Lucas McCain in the TV series “The Rifleman” from 1958 to 1963. His acting career spanned over 40 years during which he secured more than 130 film and TV roles, but the role of Lucas has indeed become the hallmark of his career. His parents, Marcella and Alban Francis Connors were immigrants from Newfoundland and Labrador. Growing up in a devout Christian family, Chuck contributed to his family’s devotion by serving as an altar boy at the Basilica of Our Lady of Perpetual Help in his hometown of Brooklyn. He attended Adelphi Academy from which he matriculated in 1939. Wanting to become a professional baseball player, Chuck received scholarship offers from various colleges and universities and eventually chose Seton Hal University. Once at the University, Chuck started playing baseball but also fell in love with basketball. Although his birth name was Kevin, he didn’t like it at all; it was during his Seton Hall University years that he changed the name to Chuck, which came from his phrase while playing baseball, when he would yell “Chuck it to me baby” to the pitcher. The nickname stuck, and he decided to adopt it as his real name. He spent only two years at Seton Hall University, as the US entered the World War II, and Chuck was needed in the Army. He was sent to Fort Campbell where he served as a tank-warfare instructor, and was later transferred to West Point, New York. Once discharged from the army, Chuck joined the Boston Celtics of the Basketball Association of America. He spent two years in Boston, and in the first home game, he became the first basketball player to break the backboard. He threw the ball towards the rim and hit the glass of the backboard which immediately broke. However, it was the glass that was installed improperly which resulted in breaking at a tiny pressure. However, Chuck became a legend that day. 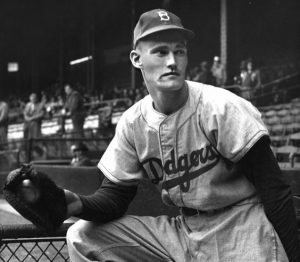 He left Boston to play baseball for the Brooklyn Dodgers, but after playing in only one game in the major league and a couple of seasons in minor leagues, Chuck left the Dodgers and joined the Chicago Cubs. His playing time increased, but after only one season he was again sent to the minor leagues, this time to play for the Los Angeles Angels. This turned out to be a turning point in his life; while playing for the Los Angeles Angels, he was spotted by an MGM casting director, and in 1952 he became a full-time actor, leaving his career in sports behind him. He was cast in the film “Pat and Mike” in 1952, as a Police Captain; although it was only a minor role, Chuck got enough encouragement to seek other roles; he continued with minor roles, securing appearances in such projects as “Hold Back the Night”, “Death in Small Doses”, and “The Hired Gun”, among others. He came to prominence in the late ’50, with the role of Lucas McCain in the highly-acclaimed TV series “The Rifleman” (1958-1963), co-starring with Johnny Crawford in this particular series which celebrated both of them – the two remained good friends until Chuck’s death. He enjoyed success following the end of the series in 1963, continuing his career with the lead role in the adventure film “Flipper” (1963), then portraying Jason McCord in the TV series “Branded” (1965-1966), followed by the lead role in the adventure film “Captain Nemo and the Underwater City” in 1969. In the next two decades, Chuck became one of the most famed actors, with roles in such successful films as “Soylent Green” in 1973, “Tourist Trap” (1979), “Summer Camp Nightmare” (1987) among many others, which only further increased his net worth. 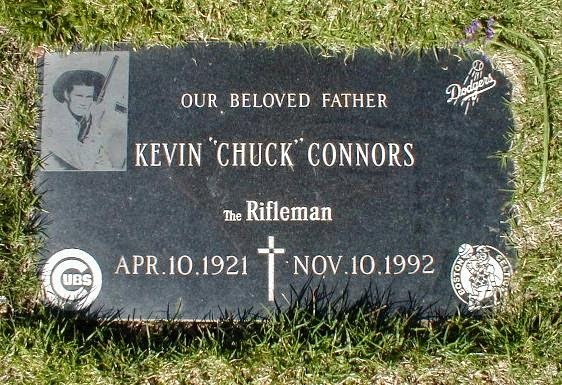 Before Chuck passed away in 1992, he appeared in several more films such as “The Gambler Returns: The Luck of the Draw” in 1991, starring Kenny Rogers, Rick Rossovich and Reba McEntire, and in the action film “Three Days to a Kill” in 1992, his final on-screen appearance. Do You Know How Rich Chuck Connors Was? With more than 130 roles, Chuck earned himself quite a decent fortune – let’s just see exactly how much. According to sources, Chuck’s net worth is estimated at $5 million. Some of the most profitable films in which he appeared include “Move Over, Darling” (1963), and “Old Yeller” (1957), which contributed significantly to his net worth. Chuck married and divorced three times; his first wife was Elizabeth Jane Riddell from 1948 until the early ‘60s; the couple had four children together. In 1963 he married Indian actress Kamala Devi; their marriage lasted until 1972. Five years later he married actress Faith Quabius but their marriage lasted only for three years. At the time of his death, Chuck was in a relationship with Rose Mary Grumley. 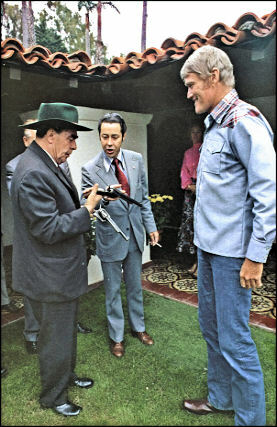 During his life Chuck had found numerous ways to give back to the community his share; he started the Chuck Connors Charitable Foundation, through which he organized numerous charity events, including the Golf Tournament, held at Canyon Country Club in Palm Springs, California every year. All that would be raised would be given to Angel View Crippled Children’s Foundation. The series “The Rifleman”, made Chuck popular around the world, including Russia. This opened the doors to the Soviet Union and developed a close friendship with Leonid Brezhnev, the leader of the Soviet Union at the time. Chuck took up smoking in the ‘40s, and would often smoke two packs of cigarettes per day. This led to a lung cancer, and ultimately his death on the 10th November 1992, at Cedars-Sinai Medical Center in Los Angeles. His remains were interred in the San Fernando Mission Cemetery in Los Angeles.